It was the father of a young boy at a Rodin show at the National Gallery and my grandmother, the consummate gardener who taught me the truth of Rodin’s statement. I was visiting the Rodin show at the National Gallery several years ago, following along behind a man and his young son as we all admired the sculptures when the boy stopped in front of Rodin’s “Old Courtesan” and looked at the dessicated body of a once beautiful woman. He was clearly put off by the sagging shape and wrinkles and asked his father why she was so ugly. The father, a youngish man himself, said “No” she was not ugly. She was old, but even an old body can be beautiful. He took the time to explain to the boy that beauty is many things. I listened, intrigued and grateful for such a lesson to a boy. I also thought that this boy would one day make a terrific husband to a woman growing old in the midst of a world of plastic surgery, the whitest teeth and unhappy women comparing themselves on Instagram. I never looked at flowers the same way again. As an artist, I love dessicated flowers and the way the shapes change from the young and perfect buds to the rich and complex mature blossoms they become. I don’t paint those flowers, but they inspire me. I’m reminded, too, that the favorite models for life drawing classes when I was at art school were not the young, willowy women, but the ones with some years and interesting curves and imperfections. 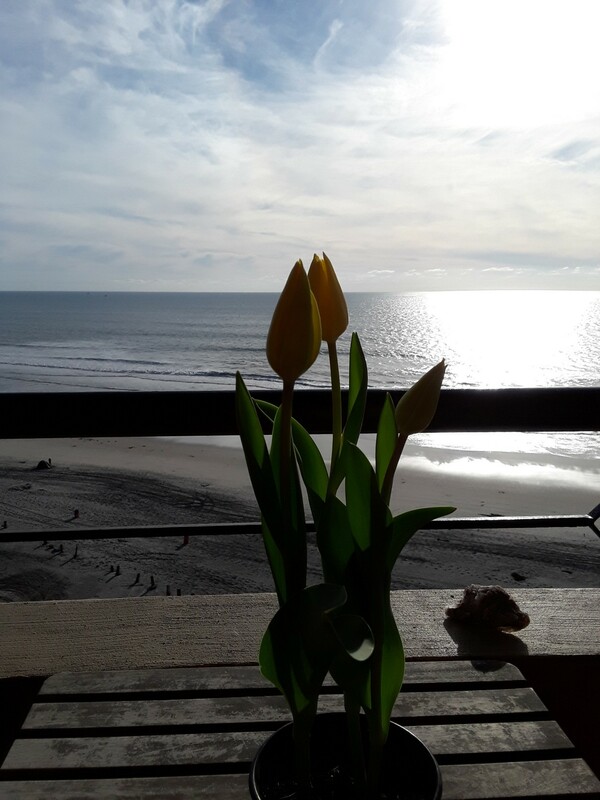 At the beginning of February, hungry for a little northern spring down here in Mexico, I bought a pot of yellow tulips – young and perfect yellow tulips. I put them on the balcony in the sunshine and gave them their own view of the blue Pacific. 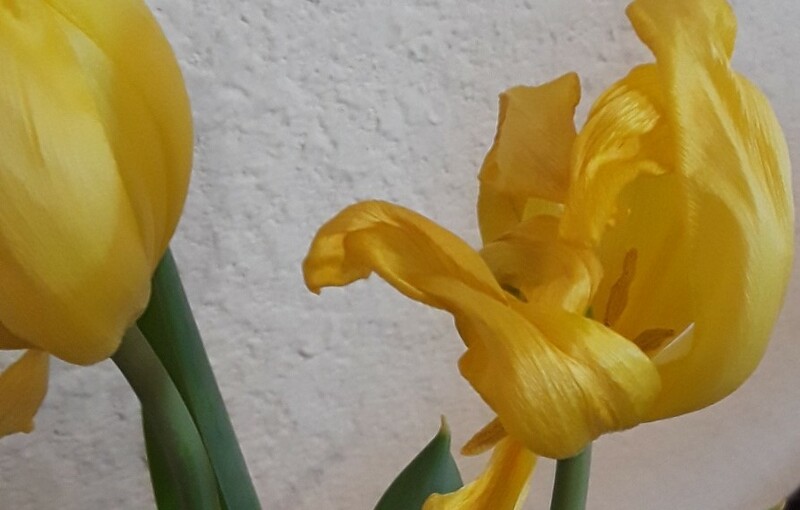 They’ve been a joy as they opened into the perfect little cups of perfect little tulips, but time passes and now they’ve reached another phase…that dessicated phase I also love. This blog was not named Art and Tulips for nothing. The perfect buds were beautiful, simple and pure. But the dessicated flowers are now as rich and complex as they come with new shadings of color, new shapes, new windows into the heart of the flower, new and interesting surprises every morning. I’ve moved them into my studio now to remind me of why I paint. And why I paint the way I do. They also remind me of the first piece of artistic advice I received. In my first class years ago, I worked hard to draw a perfect apple – the still life for the evening – with my pastels. When I finished I proudly showed the instructor and said, “It looks just like the apple!” She admired it, agreed, and then said, “Now, do one that doesn’t look just like the apple.” I heard what it means to be an artist in those few words. Thank you, Myra, wherever you are. Perfection is one thing. Art is quite another.